Caprolactam is used primarily in the production of nylon 6 fibers and nylon 6 engineering resins and films. More than half of world caprolactam consumption is for nylon 6 fibers and more than one-fourth is for nylon 6 resins and films; the remainder is accounted for by trade in polymer chip. Nylon 6 fibers are used in the textile, carpet, and industrial yarn industries. Nylon resins are used as engineering plastics, with applications in the automotive industry, specialty film packaging for food, and wire and cabling. Caprolactam is produced primarily from cyclohexane, but there are also other lesser-used commercial routes that utilize either phenol or cyclohexene as intermediates. In 2018, caprolactam production accounted for nearly half of cyclohexane demand. The gradual shifts in nylon 6 textile fiber production to Asia, followed by development in automobile, plastics, and electronics manufacturing away from more industrialized regions, have all contributed to historical growth in Asia, and Chinese nylon fiber and resin production continues to expand rapidly. In 2018, China accounted for half of the global consumption of caprolactam, and will continue to drive world consumption through the forecast period. Other Asian countries (excluding China, but including the Indian Subcontinent) collectively accounted for about 20% of the global demand in 2018, with about half of the volume being consumed in Taiwan. However, an expected decline in Taiwan will lead to an overall decline for the region in the forecast period. Caprolactam consumption in the United States is expected to increase slightly over the next five years, while Western European consumption is expected to decline slightly. The past 15 years have seen substantial investments in caprolactam capacity, primarily for the production of nylon 6 fibers. These investments have mainly been in Northeast Asia, where China is the major producer and consumer of nylon6. Increasing caprolactam capacity in China in recent years pushed down the global operating rate to a low of 80% in 2014, leading to the idling of capacity in South Korea, intermittent operation in Taiwan, and capacity reductions in other parts of the world, including Fibrant’s (formerly DSM) shutdown of capacity in the United States in 2015–16 and BASF’s reducing capacity at its Ludwigshafen, Germany plant in 2017–18. The drop in oil prices since late 2014 has resulted in lower raw material costs in Asia; as a result, the plants in South Korea and Taiwan returned to full operation in 2016. China paints a very different picture from the rest of the world, as caprolactam capacity has increased at double-digit rates for the last 15 years, and additional capacity is expected through the forecast period. This additional capacity will lead to declines in utilization rates over the next few years, with recovery to 85% by 2023. China, once a significant importer of caprolactam, now suffers from overcapacity; this has caused regional imports to decline significantly. 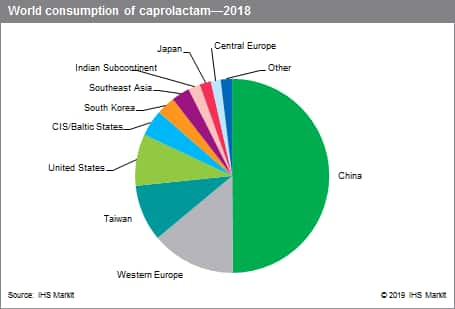 Global trade in caprolactam represented about 14% of consumption in 2018, down from more than 30% during 2001–12. Over the next five years, trade volumes are expected to continue to decline as China becomes more self-sufficient. Exports from the CIS and Baltic States and Western Europe are expected to decline slightly during the forecast period; nevertheless, these regions will continue to be the largest exporters globally.